Frànçois came to Bristol from France in September 2003. He drew a picture and put a note in a window announcing his arrival, and asking people to make music with him. He started going to car-boot sales to find some instruments he could use. Overnight, Frànçois won the hearts out of this town. Well of course, he’s a sweet kid, but he’s also armed with an eager sense of adventure and a keen taste for pop thrills. In January 2004 he played his first live show, taking to the stage alone, making use of keyboards (played with his foot), a guitar, live samples and a drum machine, mixing playful and experimental ideas with his natural pop-tune sensibilities and sweet bilingual vocals. The string of live performances he has since played has all been eagerly anticipated and utterly charming. Musically, you could say he is reminiscent of STEREO TOTAL, VELVET UNDERGROUND, HOOD, and FRANÇOISE HARDY and yet he is also like nothing else at all. 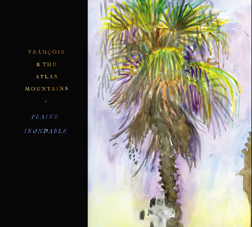 In 2008 Fránçois took a break and went back to live with his parents in France with the intention to stop the music side of things and to hide behind his brushes and watercolour paints. There he found support from a bunch of local friends who convinced him to do some recordings of the works he had prepared for a show in Paris at the Centre Pompidou. The recordings of “Plaine Inondable” took place partly in Charente-Maritime and partly in the Basques Country. For those sessions the musicians were the polyphonic quintet Bost Gehio and members from Unkle Jelly Fish.